HV Ammo in High Standard? This has likely been discussed before, but does anyone out there recommend against (cheap Remington Thunderbolt's) high velocity ammo in a late 1970's High Standard Victor? I've been using it at the 25 yard line for practice and wonder if I'm doing any damage. Re: HV Ammo in High Standard? 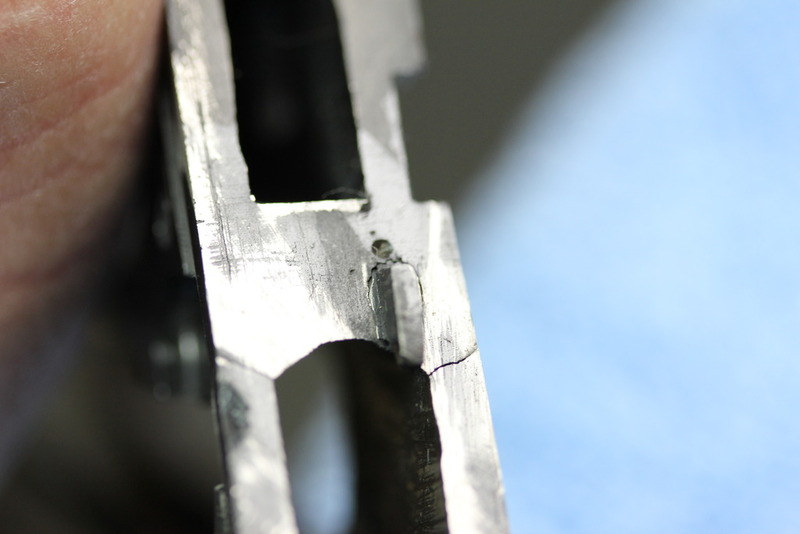 HV ammo is known to contribute to cracked HS frames, especially if you have a weak recoil spring. The crack will happen at the top of the magazine well. This is discussed a lot on Rimfire Central - see the High Standard subsection. I would never use HV in my Hamden Supermatic. I fed my 1976 HS Victor a steady diet of standard velocity .22's and still ended up with a cracked frame. I had sent it to HS in Houston in 2003 to replace the springs and do a blue job. They replaced the lower for a good price and it still shoots better than I can hold it. The guy at HS said the pistols from that period are prone to cracking since the steel was not as good as what they can do today. He was surprised, however, when I told him I had only shot std velocity stuff through it. Of course, I bought it when I was shooting with the pistol team out of Mare Island, so no telling how many thousands of rounds I had put through it. 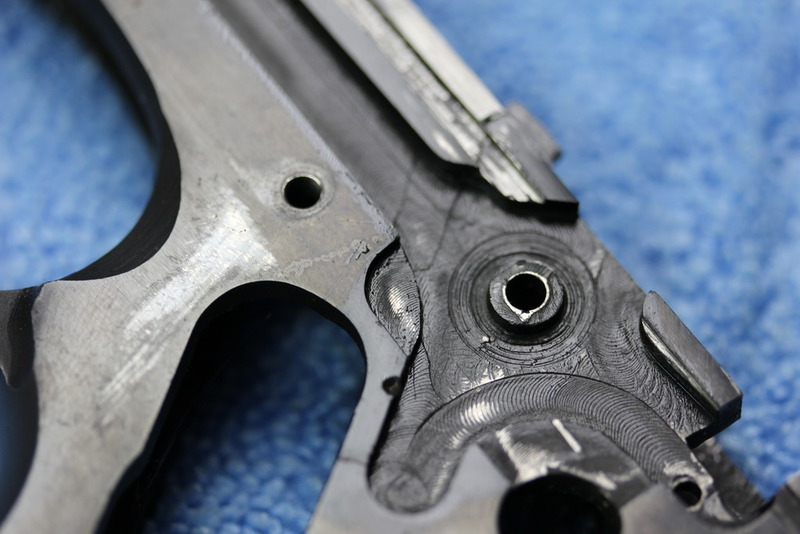 As you can see, the machining was crude and created many stress risers.. HS had very good barrels and their chambers were closer to target grade than what's commonly available in mass production today.. I'm just surprised that the Thunderduds are not causing a lot of alibis. I have shot some HV through my previously owned HS with no problem. But, I have never made it through a box of Thunderduds without at least 1 fail to fire. I had a Hammerli Xesse that would religiously break the trigger guard/slide stop after 1000 rounds without a homemade buffer and 2000 rounds with a buffer. Sent to Larry and explored all options. 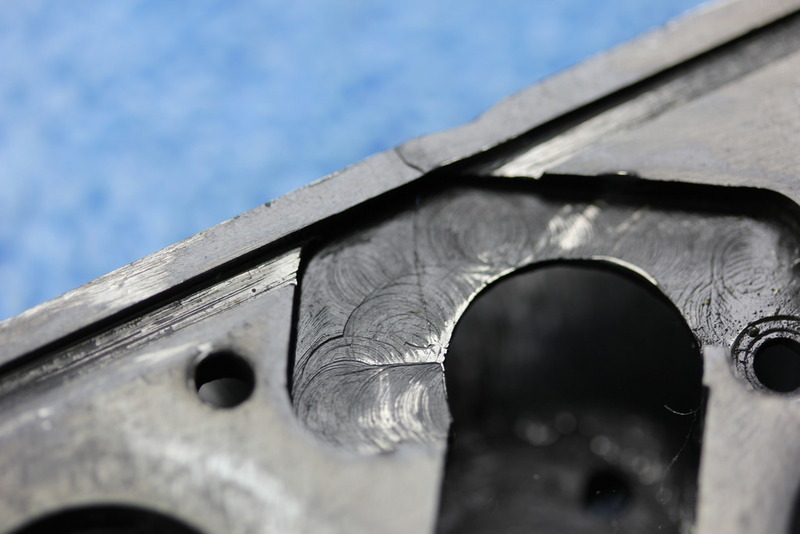 Had I decided to keep it after finally resolving the issue, I would have begged someone like Jerry or Froneck to machine a guard out of stainless bar-stock. My guess it would be a pretty popular part to sell and you can get $100 for them. I have seen several broken High Standard frames. One worse than the one Jerry pictured. Those with a known history all had HV ammo usage and weak recoil springs. When in doubt, change the spring. And never use HV ammo. Period.